Spring is here, at long last. The cherry blossoms are in full bloom on the tree outside my window, the skies are blue, the sun is shining (for now), and I'm eager to reap the rewards from my edible garden. 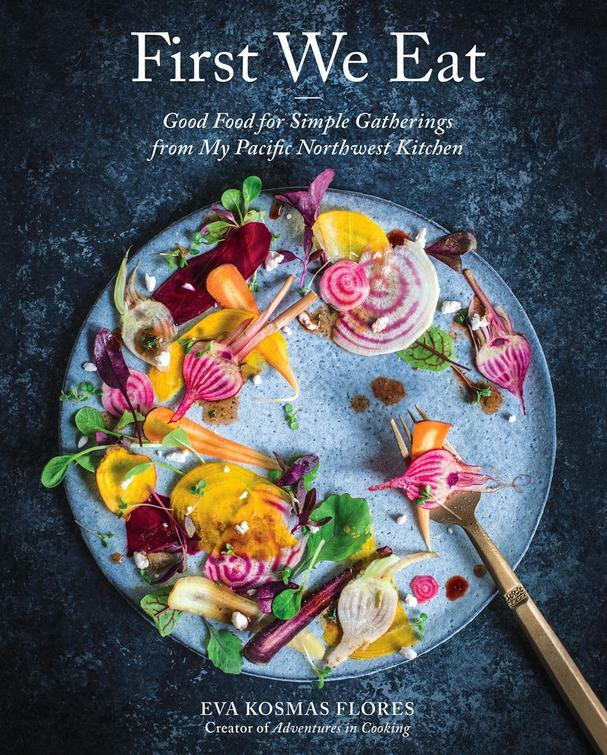 Spring also marks the arrival of the gorgeous new cookbook, First We Eat, from Eva Kosmas Flores, renowned recipe developer, photographer, stylist, and founder of Adventures in Cooking and First We Eat, her travel-based photography workshop company. First We Eat is a celebration of fresh seasonal cooking that combines her Mediterranean roots with the bounty of her Pacific Northwest garden. Her vibrant recipes are stunning yet approachable with creative combinations of ingredients that will inspire you to get into the kitchen. The book is divided by season, each beginning with a menu, and also offers a guide to staple ingredients, homemade pantry basics, and tips for sourcing your ingredients. 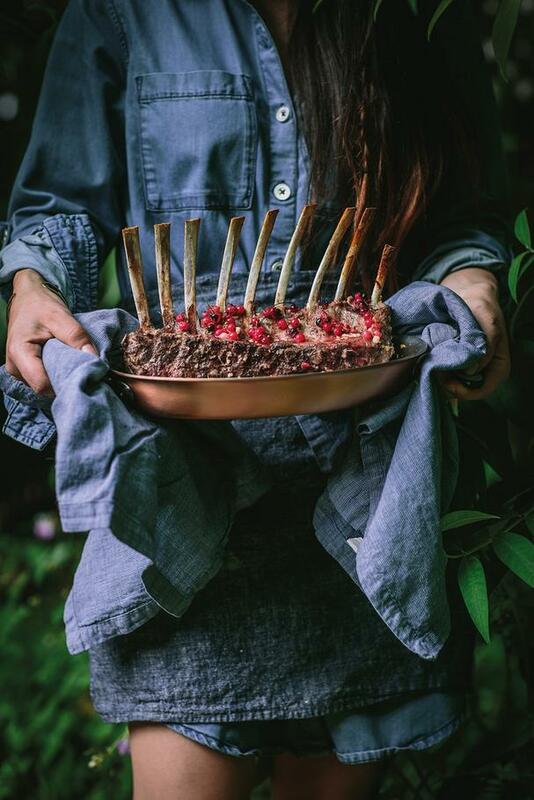 Get yesterday's featured Snap Pea Salad with Preserved Lemon and Goat Cheese Medallions recipe, the perfect accompaniment to her delicious Black Pepper Rack of Lamb with Red Currant and Rhubarb Glaze below. Tomorrow I'll be featuring Eva's Rhubarb-Ginger Planter’s Punch, so be sure to come back! Order her gorgeous cookbook here! —For the rack of lamb, use a knife to poke holes that are 1-inch (2.5-cm) deep into the lamb between each bone. Rub the lamb all over with the oil, garlic, salt, and pepper, making sure to rub the spices and garlic inside each hole as well. Cover and marinate overnight in the refrigerator. —For the glaze, in a medium saucepan, combine the rhubarb, currants, sugar, and ½ cup (120 ml) water and bring to a boil over medium-high heat. Reduce the heat to low and cook until the rhubarb begins to disintegrate and the berries burst, about 20 minutes. Strain the glaze into a bowl and discard the solids. —Preheat the oven to 475°F (245°C). Place the lamb in a small roasting pan and arrange the currants on and around it. Roast for 10 minutes for rare, 15 minutes for medium-rare, or 20 minutes for medium. —Remove from the oven and allow to rest for 5 minutes before carving and serving with the glaze.